Athenry Castle, built in 1250 by Meiler de Bermingham, is near the medieval walled town of Athenry. Located just 20 minutes east of Galway, it offers you a lovely day trip when it is open during the months of April through October. The stone tower was the start of Athenry Castle, which was built on a small mound near River Clareen (Irish spelling: Abhainn an Chlairin). The tower represented its owner’s symbol of his lordship over the newly founded town of Athenry and the surrounding countryside. The tower was completed to its full height in the late 1230s or early 1240s. A Dominican Priory was also founded next to the castle by Meiler de Bermingham in 1241; he was later buried within its church. An army of the Irish was defeated at Athenry by the Anglo-Normans in 1249. The Irish continued to live in the area, but were governed by the Anglo-Norman lords. In time, the lords intermarried with the Irish and the allegiance to the Crown of England was diminished. Towns including Athenry continued to profess loyalty, however. A major battle was fought in 1316 outside the walls of Athenry. The King of Gaelic Connacht faced the Lord of Connact and other Anglo Normans including Richard de Bermingham, the fourth Lord of Athenry. Without armour, the Irish were utterly defeated; thousands were killed. The town of Athenry had declined by the late 16th century. It had gone from 300 householders to less than twenty. At one point, the town and Priory were burnt by Ulick and John Burke, the sons of the Earl of Clanricarde. Despite the rebuilding, the Burkes attacked again. Further rebuilding of Athenry occurred after 1584; another attack was carried out by Red Hugh O’Donnell in 1596. Although the history sounds bleak, Athenry Castle and Athenry Town remain interesting. 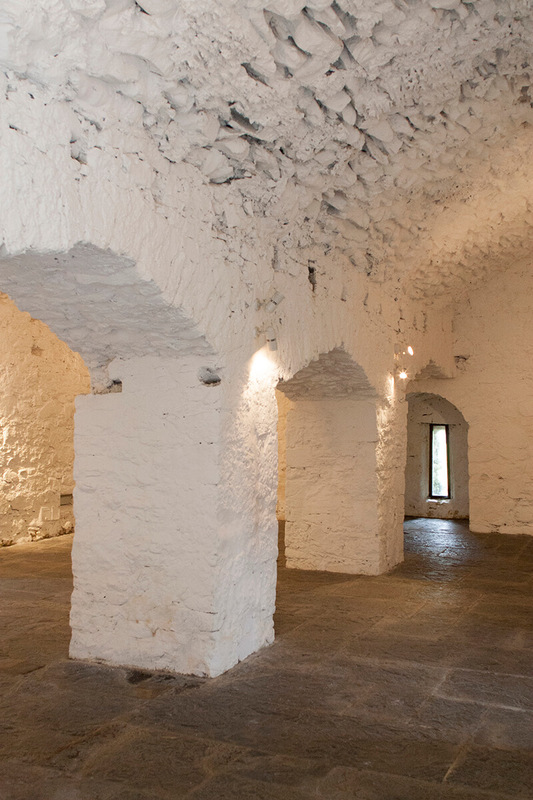 In the recent restoration of Athenry Castle, a third floor was added. The windowless second floor is currently used for an audiovisual presentation for visitors. Guided tours are available upon prior arrangement. The rectangular building has a first floor entrance directly to the hall, which was the official and ceremonial reception room of the castle. The lord received guests and tenants and presided over the manor court. Carvings on the exterior of the reception room of the castle doorway show the importance to the hall. The floral motifs are carved in a style known as the “School of the West,” which is transitional between Romanesque and Gothic. The style is also found at the abbeys of Cong, Ballintubber and Boyle. Only parts of the original enclosure wall of the castle exist today. The rectangular gatehouse did not survive. The circular corner tower at the south-east is better preserved. The walls around the town of Athenry were built around 1300 and enclosed an area of 71.25 acres (28.5 hectares). Approximated half of the circuit walls are standing on the south-east, south-west and west sides as well as a number of towers. 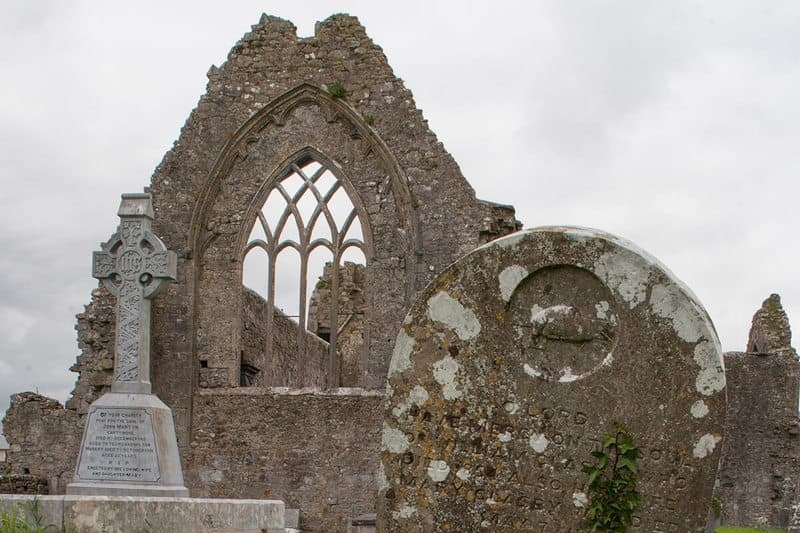 The church remains of the Priory and is situated to the south of Athenry Castle. You may enjoy a walk around Athenry to include Athenry Castle, St. Mary’s church, the market square, the Dominican Priory, the remains of the walls and moat. You may have heard of the beautiful song named Fields of Athenry. My friend, Mitch, may he rest in peace, sang a most beautiful rendition. The song tells the story of a young man imprisoned for stealing a farmer’s corn to feed his starving family. It has been sung by many Irish musicians, including Paddy Reilly. 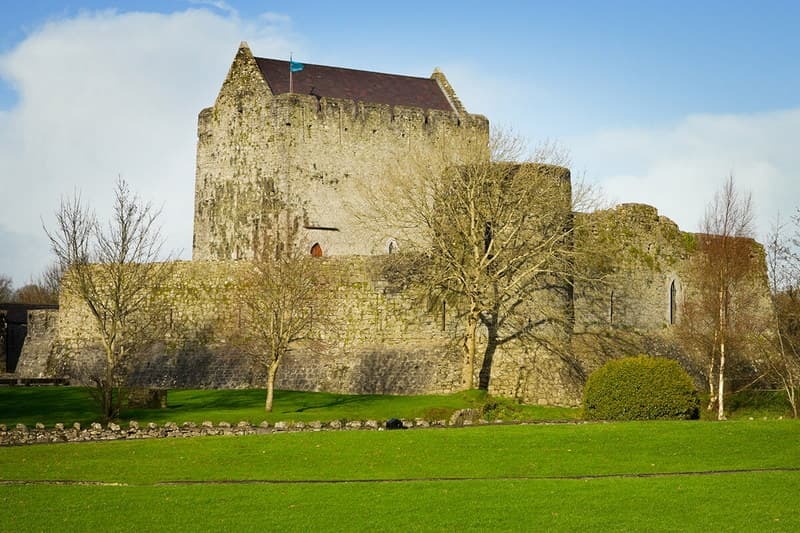 Visit Athenry Castle in Ireland and the historic walled town nearby as a lovely day trip from Galway.